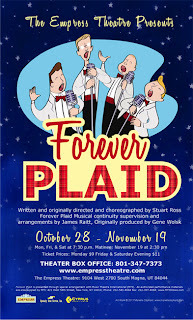 Forever Plaid may just be the most famous Broadway show to never hit Broadway and I had never seen it until this past Friday night. Oldies-style music and singing men are right up my alley, so I figured I'd give it a shot with the Empress Theatre's latest production. And you know what? That shot was worth taking. What I have to say won't be as long as normal because I don't think there is much to analyze or critique in a happy-go-lucky-character-development-free performance such as this. For the premise, all you need to know is that there are four singing young men who refer to themselves as "The Plaid's" who are killed in a car accident by some girls on their way to watch the Beatles' debut on the Ed Sullivan Show. One night, the Plaid's are lucky enough to come back to life to finish performing their final show for us so that they may proceed to heaven. Have you ever longed to be part of one of those cheesy dance scenes from the movies of the 50s and 60s? Miss prom night? Forever Plaid is a parody that evokes exactly that sort of feeling and makes fun of itself, recognizing the absurdity of everything it stands for. These guys are this loveable, adorable assortment of chumps who amuse themselves, and only themselves, endlessly. No one remembered them or even noticed their deaths. Without this premise, I may have been disappointed in some squeaky notes or in the performance of one of the characters who seemed to be battling with himself as to if he wanted to be performing. But man, as the punster geeks bursting with excitement from ear-to-ear, this whole thing just worked for me. If I hadn't heard a cracked note, an off harmony, or seen a missed doo-wop dance step once in awhile, I would not have believed the whole premise of the show. You cannot help but smile and be-bop in your seat along with these guys as you become infected with their energy. Big, amazing Broadway it is not, but a smile-inducing evening it is. At one point during the evening, you actually get to sing along with the Plaids and you will not be able to resist. Trust me. I tried. Then the nudges from all my neighbors started and I gave in to the temptation to belt out with the rest of the audience, embracing our inner Plaid. My favorite portion of the evening was probably their rendition of a classic Beatles song. True parody hilariousness. I must also give props to the staging of the live accompaniment as part of the show - they add charisma and ambiance to the evening that drives home the feeling the director, Nancy Jensen, is trying to convey. Tim Frost, the pianist, has that special something that makes me smile every time I see him on stage. If you have been thinking about attending this show, you'll enjoy yourself. The length is definitely shorter than any show I've seen this year and may just be the perfect length - it ends juuuust when you are thinking you may have had enough and you end up saying, "Hey, wait a minute - is that it?" You won't find any "bringin' down the house" numbers, but if you enjoy a good stroll down memory lane, this show is right up your alley. Might I also suggest hitting up El Habanero (8164 W 3500 S) before the show? This local Magna Mexican restaurant will warm your belly with deliciousness, but give yourself at least an hour. Speaking of warm, take a jacket - the Empress is chilly. 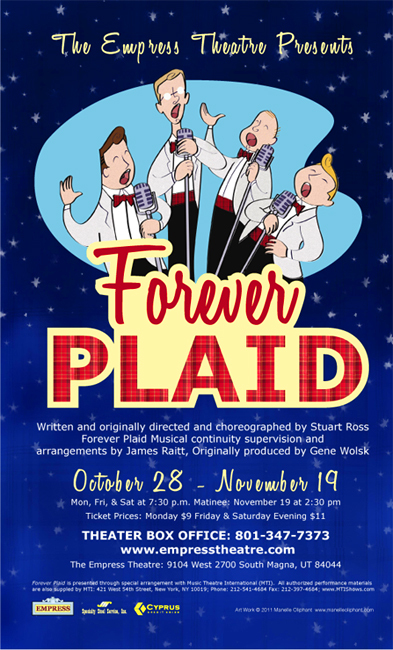 You have six more chances to catch the Plaids before they ascent into heaven: November 11, 12, 14, 18, 19 at 7:30pm with a matinee on the 19th at 2:30pm. Buy tickets here. Thanks Larissa. I'm glad you enjoyed the show!